These example scripts build computer accounts in an Active Directory domain. What happens is that the script loops through the cells of a spreadsheet, the value in each cell will be the name of a new computer count. Regard the scripts on this page as an extension of my basic create computer VBScript. Our goal is to read information from a spreadsheet, and to use that data as a source of names for new computer accounts. Whereas my previous script only created one computer account, this script is limited only by the number names that you list in the Excel spreadsheet. 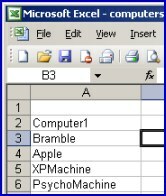 The technical advance in this VBScript is to employ CreateObject("Excel.Application"), which gives us a handle on the spreadsheet. After connecting to Excel, all we need is to script a, Do… Until empty loop. This instruction cycles through the cells reading the name of each new computer. Recommended: that you complete my basic script as a refresher on how VBScript binds to Active directory. If possible, logon as administrator, preferably at a domain controller. Create a spreadsheet with your prospective computer names in the first column. Be aware that where you save this .xls file should correspond to the strSheet variable in the script below. For example: E: \scripts\Computers.xls. Check the prerequisite to create a spreadsheet. Decide whether to change the value for strSheet. Create the names of the new computer accounts in the first column of the spreadsheet. Save the file with a .vbs extension, for example: ComputerSpreadsheet .vbs. Double click ComputerSpreadsheet .vbs and check the Computers container for strComputer. ‘ Bind to Active Directory, Computers container. Do Until objExcel.Cells(intRow,1).Value = ""
‘ Build the actual computer. objComputer.Put "sAMAccountName", strComputer & "$"
‘ End of Sample ComputerSpreadsheet VBScript. Note 1: See how CreateObject("Excel.Application") creates an instance of Excel. Note 3: When I first ran this script I noticed zillions of instance of Excel in the Task Manger, this is how I cured that problem; I added objExcel.Quit. Here is a bonus script which has the same goal, namely to create computer accounts, but this example anticipates problems. For example, the computer name may already exist, you have already run the script. ‘ End of Sample ComputerSpreadsheetADV VBScript. Note 1: This advanced version of Example 1 employs error-correcting code in the form of ‘On Error Resume Next’. In addition there is a basic error handling routing ‘If err.number <> vbEmpty’ (is not null). Note 2: I incorporated an optional extra section, which launches the Active Directory Users and Computers snap-in. My idea is twofold, to show that the script has completed, and also to point you where to check what has happened. The ability to create Computer Accounts from spreadsheets really transforms VBScript. In fact, this technique of reading data from files can be applied elsewhere. From a scripting point of view, the simple but effect loop technique makes all the difference. Like so many scripts, it mimics the actions you take to create computers manually, just imagine how you might copy names from a data file, then paste them into an Active Directory Users and Computer dialog box.